RSA: Leo, finally we meet. Our initial research led us into thinking you only did “D-Grade” scroll engraving, but your talents were greatly underestimated. An RSA member recently purchased a very nice Model 760 “F grade” with gold inlays signed by you. We would like to introduce you and your work in the Remington Custom Shop to the RSA membership. Would you begin by telling us where you were born and raised? I was born in Whitesboro, New York and moved to Mohawk at a very young age and we lived there for 20 years. We moved to Ilion in 1990. I went to work at the Arms in 1959, working on milling machines, coloring tanks, assembly of fire controls and stuff like that. I worked nine months, was laid off and then worked for Remington-Rand. I went back to Remington Arms Company and spent 37Â½ years there before retiring. How did you get into engraving? In 1967 I heard that they were looking for an engraver. I was interested in engraving, but had never done it before. At my interview Art Kerr asked me to bring in some of my art work, so I showed it to him and a couple of weeks later I was told I could have the job. Did you have any special training in engraving before you were hired? No, I enjoyed art and drawing in high school. I learned all my engraving on the job at Remington. Who was the factory engraver at the time? It was Bob Runge who was doing production engraving at the time. He is the one who taught me. I apprenticed under Runge. It took me a year or so before I was allowed to do my very first full engraving job. Bob also taught me about sharpening my tools. Each engraver sharpens differently. By the way I’m the only left handed engraver around. You did both scroll and game scenes? Once I started a gun, it was my gun and I finished it. I did whatever they wanted put on it, such as the breed of dogs and birds. In the case of the Model 760 it was big game in gold. “F-Grade” gold took me a while to learn. I didn’t get on gold right away, Bob Runge usually took care of that. After a while I got into it as Bob taught me. Gold work is tricky, and we used to undercut a scene and pound gold wire in. 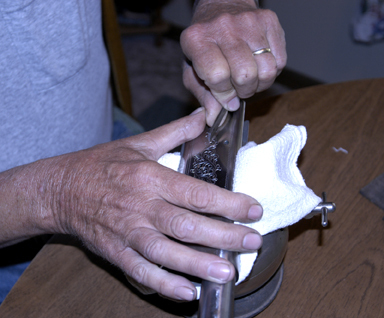 Then the gold was blended to shape. Later we cut the figure out of gold, silver soldered it in and then shaped it. Were there any other engravers working for Remington at the time? So you signed your work. 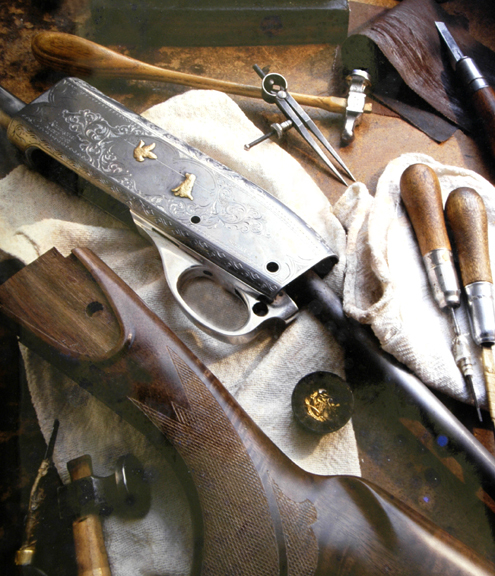 We have read that in the early years Remington discouraged engravers from signing their work. My bosses never questioned signing work. I usually signed F grade with my initials – LWB – in a rock or stump in the game scene. When did Don Talbot come on board? 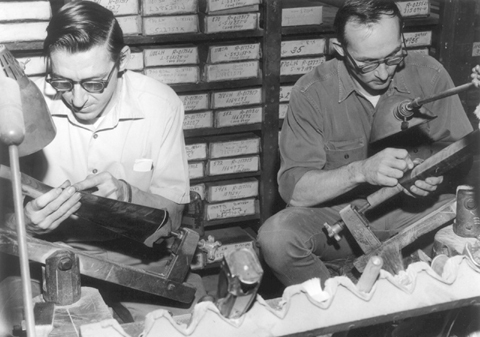 We had an engraving opening in the spring of 1979 and a number of plant workers applied. Don was selected and came on board as an apprentice to Bob Runge. 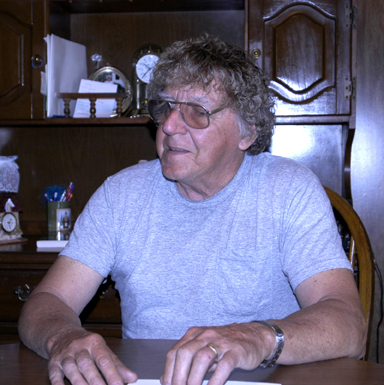 Bob retired the end of December 1979. Later Jack Caswell retired. They then moved Don and I to a different area of the shop â€“ first floor on Hoefler â€“ the “Hole”. In 1995 we moved to the new Custom Shop. RSA: How did you get started in checkering? When I came down in 1967 Edna Hinerick was doing the checkering. She passed away and I fell into the job. They wanted me to learn that, too. Runge had checkered for many years and taught me how to checker. 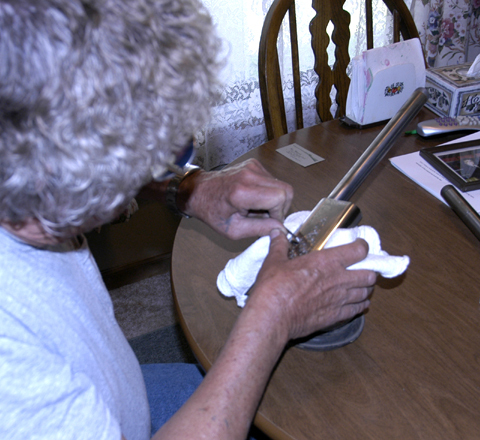 For awhile I went back and forth â€“ checkering, then engraving, then checkering, then engraving. Wherever I was needed. . Once they hired Jim Thompson to checker I went back to engraving. We know that Bob Runge kept a log of the guns he engraved. Do you have a similar log? Bob was like that. He wrote down everything. 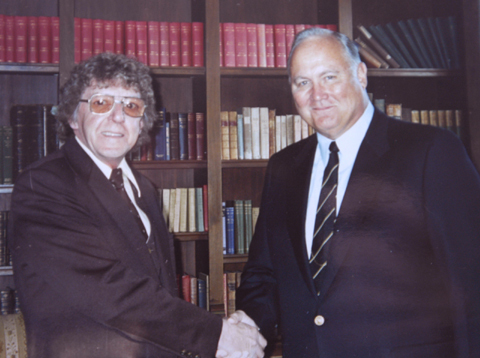 I began a log when I started â€“ a little notebook â€“ just because Bob taught me. After a while I got away from keeping one. It was a good idea, Bob wrote down everything including the hours it took to engrave a gun and did ink impressions. I also did ink impressions early on â€“ they were messy and not much detail. Later I made smoke impressions using candle smoke and clear tape. We know that each engraver has his own style. Can you describe your style? Bob started out with Parker Bros. and was into English scroll. He would work some of that in. I started with Remington scroll, just what Bob taught me. Runge used wide borders, especially on rifles and I followed his style. On shotguns we usually used a narrow thin line border. Each engraver has a different style of scroll and I can tell who did it by the scroll work. Special guns did get English scroll. A customer could request special scenes on “F-Grade” work. A Model 700 bolt action rifle would get a big game scene on the floor plate while the receiver was mostly scroll with a small scene worked in. Do you have any estimate of the number of guns you engraved at Remington? No, don’t have any idea. It was a bunch. One article mentions that you could engrave while chatting and that you might have been the fastest and most prolific engraver in the shop at the time. Your output was more than the other two engravers combined. Is that true? Yes, I could talk while engraving, it did not bother me. I like to meet people. Others like Don prefer silence so they can concentrate. I was fast both in engraving and checkering and the work was decent looking. The bosses never set hours for a job but usually it takes 10 hours for “D-Grade”, 40 hours for “F-Grade” and 80 hours for a “F-Grade with gold” scenes. My times were faster than that. engraving jobs that come to mind as really special? One customer had his favorite dog, a Labrador, die and he wanted him in gold on a shotgun. He sent up a bunch of pictures which I scaled down. It was a water scene with the Lab in gold looking at a pair of gold ducks, no hunter. He was very pleased and sent a nice letter that made me feel good. I did a Remington Model 11-87 shotgun with an eagle and 4 stars in gold on one side and two pheasants on the other for General Norman Schwartzkof. I took the eagle off a dollar bill. The General is quite a bird hunter, and is on Remington’s Board of Directors. We did several firearms for him. Don Talbot engraved the rifles and I did the shotguns. The General invited us out to dinner and we took pictures. A Middle Eastern prince had several guns done for himself and his two sons. Bob did the father’s gun in gold and I did the two sons’ guns. The sons’ guns had their initials on them. When did you retire and what are you doing now? I retired in 1997. Thereafter, I worked after hours with Bob Runge at Del Grego’s. I did most of the checkering there. They did a number of upgrades to Parker shotguns with new wood and I checkered most of the stocks. I have all of the patterns. Later after Bob had stopped engraving for Del Grego I would do some recutting and new engraving. I worked for Del Grego until I received Social Security then I fully retired. I also did some work for three other gunsmiths. I did a bunch of guns. Your work has given great satisfaction to many owners. Do you have a Leo Bala engraved firearm and are there any future engravers in the family? I enjoyed my job and going to work each day. I’m retired, but still like to look at engraved arms. I have a couple of guns I’ve started engraving. Here is a Model 1100 receiver polished with scroll work and a setter in the center panel. I have also started a Model 870 with geese flying and woodcock. When I have time I do a little more. The background will be matted. Don’t know what I’ll do with them when finished. I have three children and three grand children but no future engravers. Right now, Patricia and I have a 30 foot camper at a site on Belvedere Lake near Cherry Valley. I enjoy fishing and playing their nine hole golf course. Thanks, Leo, our readers will enjoy learning more about you and your passion for engraving Remingtons.